It was my father's persecution as an outspoken Birragubba man, that has given me the incentive to continue speaking out for justice and human rights. Dad was removed as a half-caste child from the community of Ayr, North Queensland, and sent to Palm Island under the Protection Act. One week before he died he was visited by Birragubba elders, where they conversed in fluent language. When asked why he did not teach his children the language he replied, "I have too many wounds from the beatings we received when speaking our language". In 1957, my grandfather was one of the six men who went on a hunger strike on Palm Island for better conditions. All six men were handcuffed, chained and separated again from their families and sent to others reserves in Queensland. My grandmother is still alive today, with these memories. 1995 is the year of celebrating Victory in the Pacific; a time when all Australians remember, and pay homage to the many thousands who fought for freedom. We remember those who paid with the greatest gift of all, their lives. Many indigenous people enlisted in, fought and died in wars when governments refused to recognise them as citizens of this country, their country, Australia. Professor Grace Smallwood is a registered nurse, a registered midwife, and has also completed a Diploma in Indigenous Mental Health and was the first Indigenous Australian to receive a Masters of Science in Public Health (James Cook University). 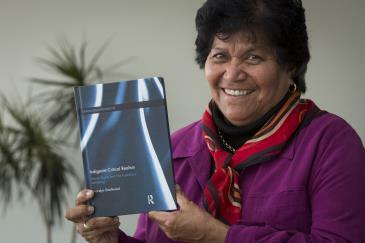 In 2011, Prof Smallwood completed a PhD Thesis Human Rights and First Australians Well-being. In 2014, Prof Smallwood became a member of the Queensland Mental Health and Drug Advisory Council. In 2015, Prof Smallwood was appointed as Member of the Harvard FXB Health and Human Rights Consortium, a Member of the North Queensland Primary Healthcare Network (NQPHN) Clinical Council for the Townsville-Mackay region, and a Member of the Federal Ministerial Advisory Committee on Blood Borne Viruses and Sexually Transmissible Infections. Prof Smallwood is a Professor of Nursing and Midwifery at Central Queensland University.